The ancient site of the Palace of Phaistos, Φαιστός lies 62 km south of Heraklion, in the central south of the island of Crete in Greece. This site is significant in European history as records indicate it was inhabited since the Neolithic age, that being roughly since 4000BC. The lush valley of the Messara provided plenty of sustenance to early communities and succeeding societies. 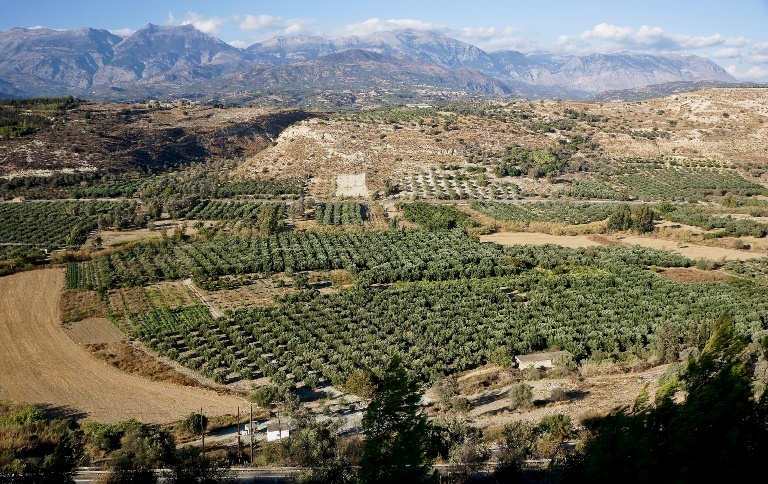 In prehistoric times, types of dwarf elephant and dwarf hippopotamus lived here, although these species are now extinct, and the area is now known for its market gardens producing vegetables and thousands of acres of olive groves. 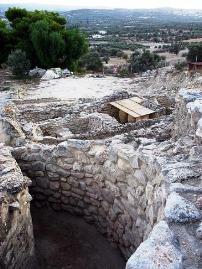 The site now contains Minoan ruins from the Palace of Phaistós, considered the second-most important Minoan palace on the island. The ruins are extensive and worthy of a day's visit. The views across the valley and over to the Psiloritis mountains are an added pleasure whilst exploring the site. It is also known as Phaestos, Festos or Phaestus. The most intriguing artifact found here is the Phaistos Disc. This circular flat clay tablet, dated around 1500BC, shows a number of imprints of symbols, leading to many different interpretations of its use and meaning; still not resolved to this day. The symbology found on the disc resembles the symbology found on clay seals found in many archaeological sites throughout the Mediterranean and thought to be some early trading record. 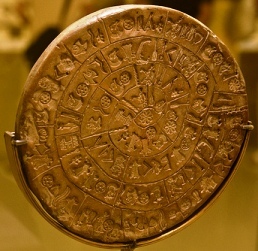 The Phaistós Disk is now displayed at the Archeological Museum of Heraklion. 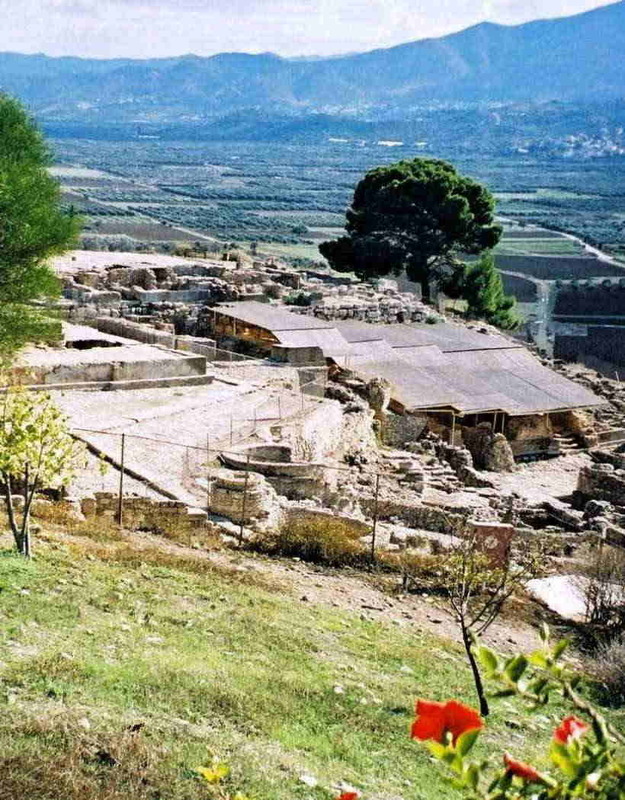 Other structures were built on this same site during the Hellenistic period, including the Temple of Rhea. During Roman occupation the nearby city of Gortyna prevailed, leaving these settlements in ruin. The site lies just off the national road 9 km south of the town of Moires. There is a comprehensive bookstore, café and souvenir store at the site, and plenty of parking. Be careful to check opening hours during the off-season as the hours may vary. 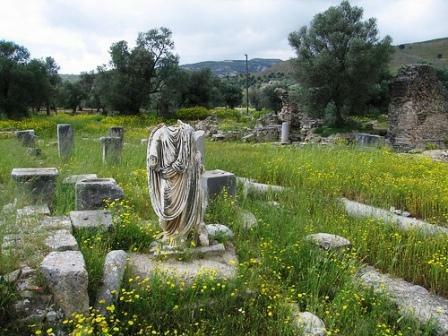 Many travellers combine their visit to Festos with a visit to the ruins of Gortyna, where, as legend has it, Zeus made love to Europa under the plane tree. 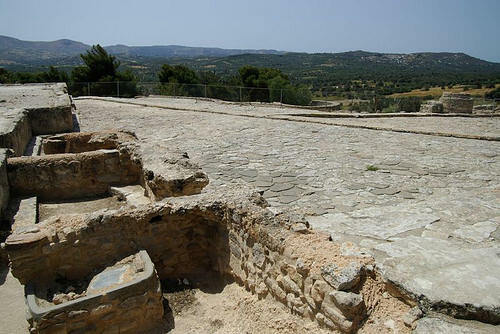 Gortyna is 17 km from Phaistos. 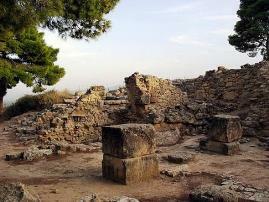 Combine a visit to this archaeological site with a visit to Gortyna (above), just 22 km to the east. If you are coming from Heraklion, visit Gortyna, then Phaistos and then head to the beach at Matala or Kokkinos Pirgos for a seafood lunch by the bay. 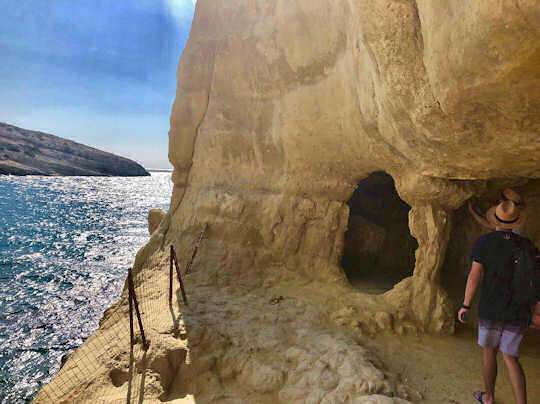 A day trip to Phaistós can also easily be combined with a visit to the beach at Matala Beach, where there are also ruins of roman caves and a very interesting history. Another nearby beachside village is Kokkinos Pirgos, a sleepy fishing village on the south coast where visitors combine sea, sand and history, and a visit to the Red Castle Fish Taverna. Another more mountainous route is to visit the town of Zaros just 20 km inland, where you can taste the local traditional Cretan food, served at Vegera Taverna, or fresh water trout and salmon grown in local fish farms. The local traditional village of Vori has been preserved as a protected village. 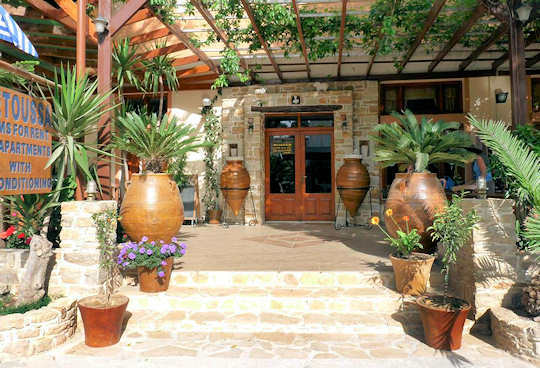 In this relaxed, typical Cretan village, you can see the heart of the Messara. Nearby is the village of Kamilari on some low hills overlooking the Libyan Sea. A stay in this village gives you a good position for exploring both the beaches and the ancient sites of southern Heraklion. Side A: Most high Lady of the illustrious palace, Most high (A)usonia, Lady of the blessed and patroness of the palace of the capital city, Phaistos. Megare, the daughter of Creon, puts there to You, the daughter of Creon, in the chapel of the palace of the illustrious, the daughter of Creon, Megare, puts there to You the disk. Amenophis (III; an Egyptian Pharaoh), very good judge of public and civil law, has been granted to Europe (his mother, the mitanni Mutemuya) for nursing, and therefore joined to the strong Noda, to Delia-Noda, the celebrated Rhadamanthus. Side B: To Delia, strength of young people, strong goat of the Grand Vizier Ehud-Min (Minos). To the heavenly wet-nurse, to Delia wet-nurse, holy wet-nurse of Ehud-Min's youthful vigour, Ehud-Min which Delia-Noda has helped to give birth. Having been sprinkled to the two great (i.e. Rhadamanthus and Minos) the big (Syrian) oak supported by the double horns, the priest of the Ida (cave) then kills for You a Min (Egyptian god) bull (Minotaur) and tunes up a hymn to the morning ship "The wife of Re", that is (to the ship) of the double horns Lady, Selene. Lastly Benapros (a priest) paints (with red) the entry stone (to the Ida cave) with the marks of Your great power. 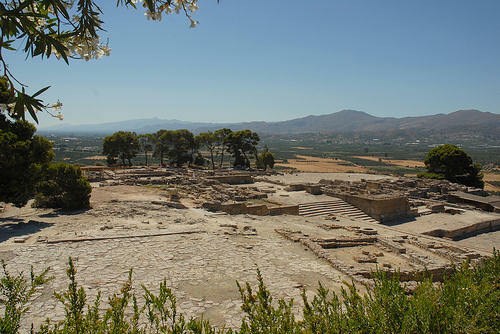 Or book a local private guide to interpret the site for you, and bring the history alive. In the surrounding villages and beaches to the south, you will find perfect accommodation for visiting this archaeological site and other historic sites of southern Heraklion, we suggest a few below. In the village of Vori you will find the comfortable Patriko Country House, welcoming 6 guests with plenty of space and a private garden within the village. 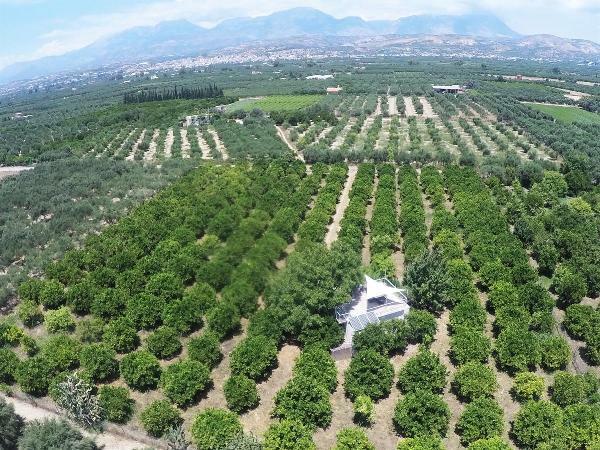 Just outside the town of Moires is the Country House on Orange Farm - be surrounded by the lush messara farming valley, literally in an orange grove, in this relaxing country home. 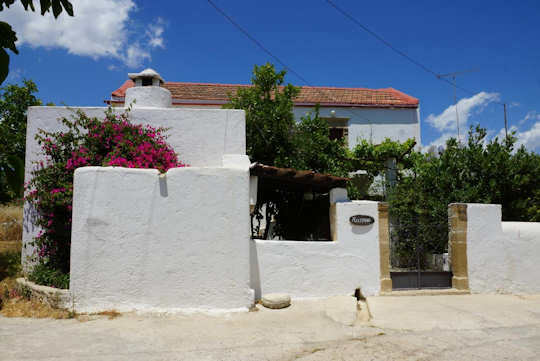 In the small village of Pitsidia on the way to Matala Beach you will find the small and friendly Pension Aretoussa, just 4.2 km from Phaistos and 4 km to Matala Beach. Below is a video of the Phaistós Palace archaeological site as it stands today. See location of the major historical sites in Crete on the map below. Fly for 1 hour from Athens to Heraklion International Airport HER. Drive south on the national road for 62 km, via the towns of Heraklion, Agia Varvara, Agioi Deka and Mires. After 60 km, turn east following signs for Phaistos Φαιστός or Festos, this small road leads to the site after 1.3 km. There is plenty of parking, shade, a cafe and a museum shop at the entrance to the archaeological site. Local buses leave Heraklion from Bus Station A at the harbourside regularly for Phaistos. Take the bus to Matala marked ΦΑΙΣΤΟΣ - ΜΑΤΑΛΑ. More details for flights, ferries, bus and hire car below.